Many thanks to my beautiful wife Angela, who very reluctantly allowed me to take this picture of hear ear for today’s post! Hello, and happy Word Wednesday! Today I wanted to share a bit of vocabulary related to hearing and ears. The most basic word here is ear, which are the organs on the side of your face that help you hear. The bottom part of the ear is called the earlobe. That’s the part that many people pierce so that they can wear earrings. In the picture above, you can see Angela’s earring in her earlobe. She got her ears pierced when she was about seven years old. In her case, her sister pierced her ear with a needle, but it’s also very common these days for girls to get their ears pierced at a store that uses a piercing gun. So, what can you do with your ears? Most people can hear and listen with them (see the post from Monday for an explanation about when to use these two words). Synonyms for hear and listen can include “listen up” and “pay attention.” If you hear someone say something but the person wasn’t specifically talking to you, then you overhear something. If you are deliberately spying on other people and listening to their conversation without their permission, you are snooping or eavesdropping. But what if your ears get dirty? 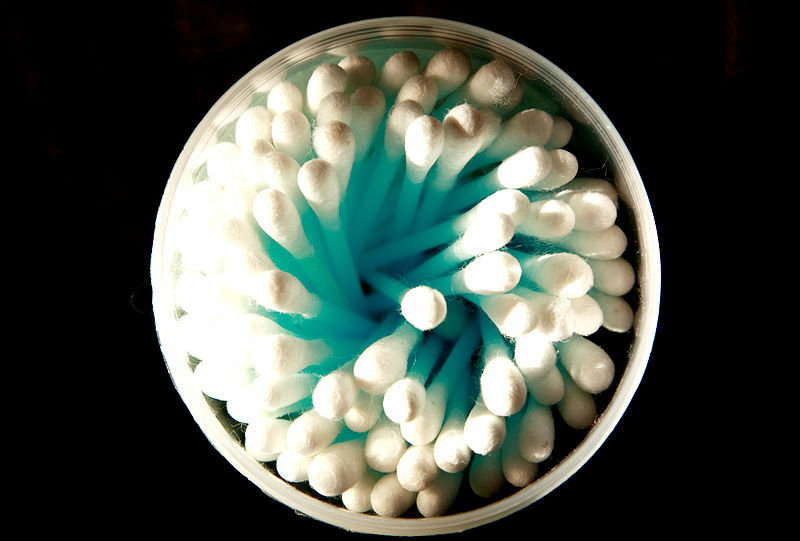 Most people clean them with a Q-tip (which is a brand name for a cotton swab). But be careful! Supposedly, according to overprotective mothers all over the world, you shouldn’t stick a Q-tip too far into your ear or you’ll break your ear drum, one of the parts of your inner ear that helps you hear! Let’s review the words we covered today. Can you explain what each of these words means? If not, read the post again. The definitions are at the bottom of the post. Could you define those words? If not, check the post again. Here are some suggested definitions for these words. I hope that vocabulary was helpful! If you have any comments or questions, I’d love to hear from you! Thanks for reading, and have a great night!